A wall slides open to the setting sun, the crowd is whipped into a frenzy and the music reaches a crescendo. A jumbo jet emblazoned with "United States of America" glides past in a graceful landing, before nosing back into view as Simply The Best blares from the speakers. A door opens, and a man with a stiff orange hairstyle waves and walks down the stairs, taking the stage to God Bless The USA. At times during Donald Trump's Saturday Florida rally, I find myself swept up with the crowd, involuntarily smiling or feeling the urge to clap as the room erupts. More often, it is wearisome, with the President repeating all the familiar lines - the dangers of the migrant caravan, the US becoming a "sanctuary for ruthless gang members", corrupt Democrats who let others "steal our jobs". The crowd hangs on every word, booing or cheering as the pantomime requires, waving signs and chanting the key phrases: "Drain the swamp! ", "Lock her up! ", "USA! USA! USA!" and even "Space Force!" 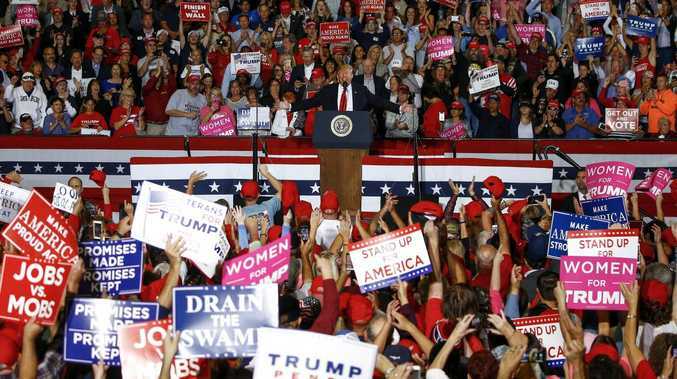 Mr Trump is nearing the end of his astonishing run of 11 rallies in six days leading up to the midterm elections on Tuesday. He's the "Energiser Bunny", according to one onlooker, and it may be his greatest strength. There are dramatic storylines, goodies and baddies, and childlike whimsy. This is why Mr Trump is seen as a president who keeps it real. "He's not the status quo of Washington," Chris Oaks, a 30-year-old sound technician, tells news.com.au. "The divide that we have here in America, I kind of put that off on past politicians. "He is pro-America, he's not for the socialism that is taking over the world, in my opinion. He's pro-capitalism." The President draws in his fans here in Pensacola with dark tales of socialism and financial disaster under the Democrats, before painting a beautiful picture of his dream America. The audience can't get enough. Some in the long queue outside the airport hangar have camped overnight to ensure they get in, while others arrived at dawn for a rally due to start at 6.30pm. There is a festival atmosphere here on the conservative Florida Panhandle, with portable toilets, entrepreneurs selling merchandise from carts, and spontaneous singing from queuers dressed in red, white and blue and slogan T-shirts. The pop music with a message is key today. There's Macho Man, Sweet Home Alabama, Under Pressure and YMCA. Mr Trump even sings a few bars of the latter to help us recall the name of his new trade agreement, USMCA (US-Mexico-Canada agreement). It's the last weekend before the US goes to the polls, and Mr Trump is going full-throttle to make sure the Republicans retain control of Congress. The Democrats may struggle to gain a majority in the Senate, but are expected to win the 23 House of Representatives seats they need for a majority. Even Mr Trump this week allowed for the possibility, insisting it wouldn't matter. The crowd here is confident "the red wave's a-coming". The President kicked off his mega-run of rallies in South-West Florida on Wednesday, and was back in the battleground state three days later, determined to ensure the rest of the purple state turns as red as Pensacola, on the northwest Panhandle. Mr Trump needs Florida. The state chose him in the presidential election by a 1.6 per cent margin, but also twice voted for Barack Obama. It is where the President spends his weekends at his lavish Mar-a-Lago golf resort. "It's my home also," he tells the crowd. "I love the state of Florida and I have to tell you, we love the Panhandle." Here, Republican Ron DeSantis and Democrat Andrew Gillum will fight it out for governor in one of the nation's tightest and hardest-fought races, while outgoing Republican governor Rick Scott and incumbent Democratic senator Bill Nelson face another too-close-to-call match for the Senate. 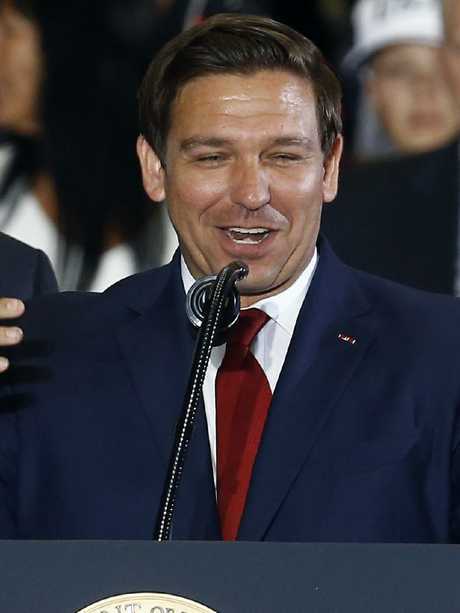 Mr DeSantis is a man crafted in Mr Trump's image. The Republican former navy prosecutor has appeared in a TV advert teaching his young children to "build the wall" with blocks and to say "Make America Great Again". He uses the same phrases, the same style of speech - the President at one point jokes that the gubernatorial candidate has "stolen his speech". Mr DeSantis is not the only one. "America is back and we're just getting started, Florida," Vice President Mike Pence tells the crowd. It's a celeb-packed affair, with boxer Evander Holyfield and American football coach Bobby Bowden also in attendance. Florida is also where Cesar Sayoc allegedly put together a chilling plan to send pipe bombs to some of the country's most vocal Democrats and Trump critics. Many have blamed Mr Trump's incendiary statements and tweets for galvanising the suspect's white-hot fury, and for hate-fuelled violence such as the killing of 11 people at a Pittsburgh synagogue, the worst anti-Semitic attack in US history. But the President does not accept culpability, instead pointing the finger at his political opponents and the media. He tells everyone to turn and insist the media to move the cameras around and show the size of the crowd. "They never do," he mocks, as the audience turns, some waving and cheering, some shaking fists and booing. Others are searching for the despised CNN, or their favourite far-right bloggers. Florida is the perfect embodiment of a deeply divided America, with Mr DeSantis and Mr Gillum a personification of each side. Mr DeSantis has painted the Tallahasee mayor as anti-police and made much of his acceptance of tickets to Broadway show Hamilton from a group including an FBI agent. Mr Gillum, who could be Florida's first black governor if he can capitalise on a wafer-thin lead in the polls, denies any wrongdoing and is not under investigation. But Mr Trump has seized on the opportunity, calling him "a thief" and mayor of "one of the most corrupt cities in the country". On Saturday, he called Mr Gillum "a radical socialist" who "will tax and regulate your jobs into oblivion" and "end all borders", warning: "When you have people camping out on your front lawn, remember Gillum has people come in." On the other side, Bernie Sanders and Barack Obama have been issuing their own warnings as they campaign for Mr Gillum and Mr Nelson in Florida. "The character of our country is on the ballot," Mr Obama told a crowd of 4000 in Miami on Friday. "In the closing weeks of this election, we have seen repeated attempts to divide us with rhetoric designed to make us angry and make us fearful, that's designed to exploit our history of racial and ethnic and religious division, that pits us against one another to make us believe that order will somehow be restored if it just weren't for those folks who don't look like we look, or don't love like we love, or pray like we do." Everyone will be watching this election. It has become a debate about what America stands for, and how it exists in relation to the rest of the planet. Gender, class and race are paramount. "I'm not calling Mr DeSantis a racist," said Mr Gillum in his final debate with his Republican rival on Wednesday. "I'm simply saying the racists believe he's a racist." Thomas Brown, attending with his 17-year-old son, says he used to vote for Mr Obama, until he realised, "Presidents say things, and don't do it." Mr Brown, one of the few African-Americans in the crowd, isn't concerned by accusations of racism, and is impressed with Mr Trump's effectiveness on unemployment and undoing the Trans-Pacific Partnership. "He's no worse than anybody else, judge people by their actions," says Mr Brown. "He seems to care about America, and when America does well, we all do well." Mr Trump is hoping the great trick he pulled off in 2016 can be repeated, using a tried and tested method. There are always new talking points - birthright citizenship and the unfair treatment of Brett Kavanaugh, for example - but the repeated sound bites and catchy refrains work. What's more, they trust his record on employment and the economy is all the evidence they need. "He's one of us," says Sandra Miller, from Mississippi. But that's just it. Billionaire Mr Trump is, if anything, awkward in his displays of empathy. "Take care of the person!" 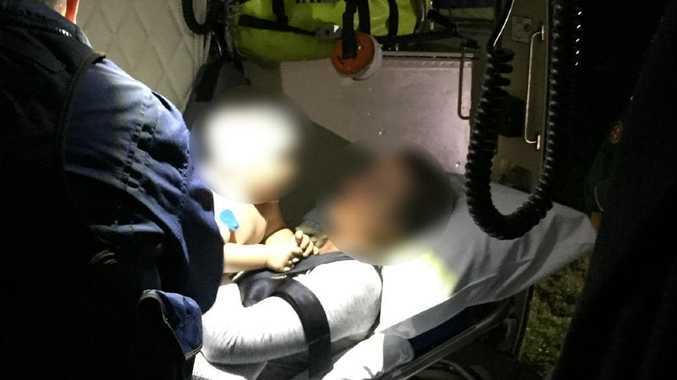 he tells security when an unwell woman needs to be helped out of the crowd. His words of sympathy over the recent hurricane are also typically odd. "It was a bad one, that was like a giant tornado, that wasn't a hurricane that was like a 50-mile wide tornado, incredible," he tells the crowd. Perhaps that awkwardness, his stumbling over words, is what makes him relatable. "Nobody's ever seen anything like that, but you are great people and we are with you one thousand per cent," he adds. "In just three days, the people of Florida are going to elect Rick, Scott and Ron DeSantis to protect jobs, defend your borders and continue making America great again we're just days away from one of the most important elections of our lives." There's one other vote that may be even more important to Mr Trump - the presidential election in 2020. He has never stopped campaigning to win that second term. "We will never surrender!" he declares at the end of the rally, channelling Winston Churchill as the emotion reaches fever pitch. "We bleed red, white and blue! "Our new theme - we could probably do it now because we're so ahead of schedule - is Keep America Great." The room rings as the crowd joins in with his refrain.